Since opening in February on a cozy corner of Main Street in Franklin, The Bowery has spurred a nightlife in downtown. Nary an evening goes by now when there aren’t cars parked on the street, says Linda Harbuck with the Franklin Chamber of Commerce. Before, she says, most people went home at five o’clock. That was the goal restaurateur Charlie Hyland and builder Brett Murphy had when they converted the former furniture store building into a polished restaurant that would rival those found in big cities. And they’ve succeeded in drawing locals and visitors alike. Live music on some nights, televisions above the bar quietly tuned to sports, and beef-braised nachos and $2 draft specials for game nights, as well as Sunday suppers, are designed to welcome the local community. The suppers, featuring reasonably priced family-style meals, are an opportunity for families to test the waters, says Chef Ken Naron. “We had the idea that if you’ve been at church and running around all day, this is the place to come relax with the family,” he says. All these extra efforts have made The Bowery a must-visit. Inside, mounted chalkboards stocked with names of regional farms broadcast the specials along with beers on tap. Backlit liquor shelving and a stunning long gray and white stone bar supported by rough-hewn wood planks marry rugged elegance with the familiar. And three distinct types of subdued lighting, including industrial pipes and Edison bulbs, set the mood. On the walls, oversized black and white photographs of farm life hint at the farm-fresh cuisine that’s in store. Chef Naron, originally from West Monroe, Louisiana, learned much of his trade at his grandmother’s elbow and in a number of creole restaurant kitchens. He studied at the California Culinary Academy in San Francisco, where an externship at the notable Charles Nob Hill whetted his appetite for fine cuisine. After several years in the Golden State, he was snapped up by Old Edwards Inn & Spa in Highlands, serving as sous chef to Chef Johannes Klapdohr and working closely with the in-house farmer. Indeed, on a recent visit, a starter of Brasstown skirt steak tacos with a mild aioli sauce is at once visually appealing and delicious. A trio of deviled eggs allows the more subtle herbs and spices of the creole egg to shine. And Naron’s chicken ‘n’ dumplings—crispy breast, braised thighs, black pepper dumplings, and a light chicken gravy—elevate a traditional comfort dish. 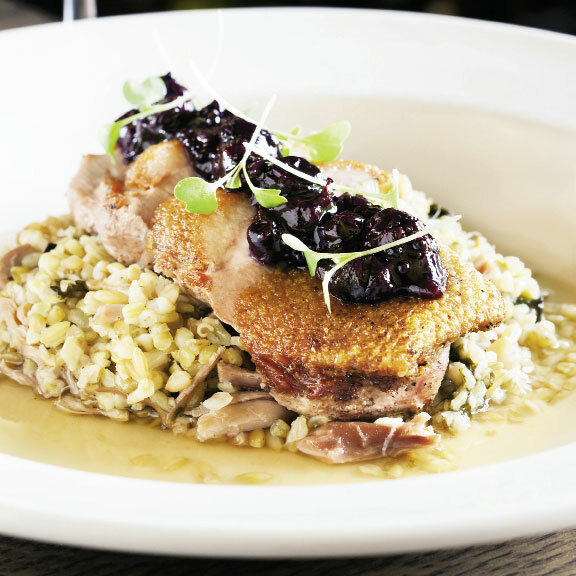 For something light, I opt for the seasonal duck breast that rests atop farro, which imparts a pleasant chewy note to the meal. The last of the season’s dandelion greens adds a piquant undertone to the savory brown broth, and a sweet blueberry compote lends an elegant interplay of flavors. A full wine list and variety of beers on tap make choosing easy (or difficult, depending on one’s decision-making abilities). But truly, the Bowery Sour composed with maple syrup had so many autumnal notes that it accompanied the meal right to the finish. To complete my dinner, attentive servers recommended the chocolate fudge cake, which is baked with a rich chocolate chip cookie inside of it and topped with house-made toasted pretzel ice cream. But I opted for a berry crumble comprised of piping hot, tart blackberries, blueberries, and the season’s last raspberries, under a light oat and brown sugar streusel and pooling buttermilk ice cream. Never has another fruit dessert measured up to this one, quite possibly. Naron’s wife, Mandy, is the pastry chef. I also tasted the pretzel ice cream, which had the silken texture of gelato and the perfect sweet-salty combination to end the dinner. Whether going for a night on the town or a sit-down supper with the family, The Bowery brings new dimension to the table in Franklin.